(Trent Nelson | The Salt Lake Tribune) The Utah Jazz introduce their top draft pick Grayson Allen in Salt Lake City, Wednesday June 27, 2018. 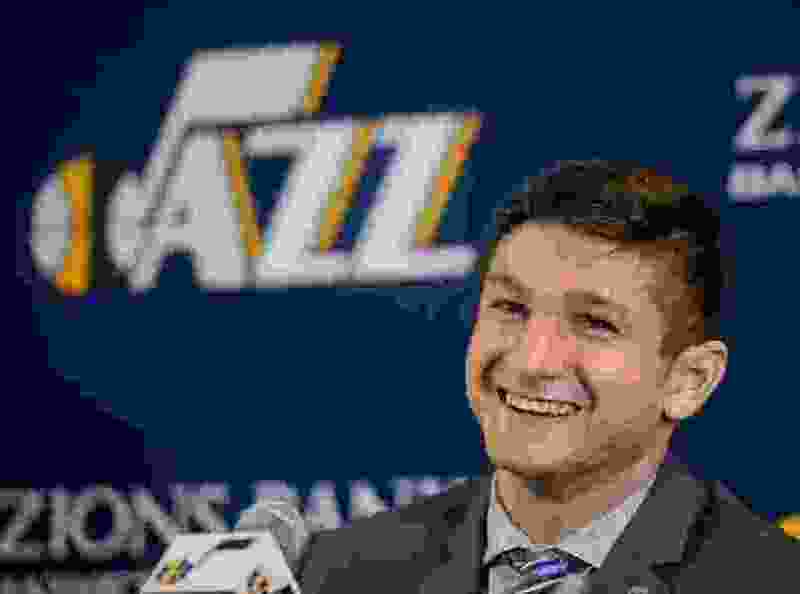 Grayson Allen sat at the podium in the bowels of Vivint Smart Home Arena, his first professional game behind him. He’s went through pre-draft workouts with the Utah Jazz, and after being picked in the first round, endured a three-day minicamp. But Monday night, following a summer league win over the San Antonio Spurs, is when it finally hit him. “It feels real now,” Allen said. Ahead of Tuesday’s game against the Memphis Grizzlies — a game in which Allen will sit out for rest — the 6-foot-5 guard out of Duke put up an impressive stat line against the Spurs in a 92-76 win with 11 points, eight rebounds and seven assists. He flashed a terrific first step at times. At others, he made high-level passes to shooters on the perimeter. But Allen wasn’t about to give himself a passing grade, not when he went 4-for-16 shooting from the field. On one sequence in the second half against San Antonio, Allen corralled an offensive rebound but missed a point-blank layup, shook his head and began muttering to himself on his way up the floor. This is who Allen is, and always has been: fans, coaches, friends and family say there’s nobody more critical of Allen than he is on himself. Yet objectively, the Jazz were pleased with his performance even with an inconsistent jumper. The acclimation period for rookies is usually significant. In Allen’s case, he’s played precious little 5-on-5 basketball since his final days at Duke. And it wasn’t just Allen on Monday night for the summer league’s star rookies; Atlanta’s Trae Young was 4 of 20 shooting and Spurs guard Lonnie Walker IV was 3 of 16. Only Memphis’ Jaren Jackson Jr. fared well with eight 3-pointers in the Grizzlies’ win over the Hawks. Allen was able to balance his poor shooting with his floor game — and many of Allen’s misses were on open looks that should start falling as summer progresses. Even with some of his struggles, Allen felt like he belonged. The moment didn’t overwhelm him, especially mentally. When he made a negative play, he kept playing and didn’t let mistakes snowball. Most importantly, Allen displayed the ability to play both guard spots. He was equally adept to making plays and creating shots off the dribble, or curling into the lane off screens. That versatility is one of the traits that endeared him most to the Jazz during the draft process. As summer rolls on, Allen would like to shoot better. But keeping his turnovers to a minimum and defending well are priorities as well. Wells said he and the Jazz will continue to do different things with Allen to see how he responds.